In her 1948 novel “Trollkarlens hatt” (Finn Family Moomintroll), Finnish author Tove Jansson describes how on the first day of spring Moomintroll and his friends discover a large, black hat and bring it home without knowing that it is the Magician’s lost hat and that anything that stays in the hat too long will be transformed into something completely different. The first items to end up in the hat are some eggshells and next morning, they discover several small clouds. Experimentation yields the facts that they will carry a person and that it is possible to steer them to where you want to and they have a lot of fun riding their little magical clouds before they disappear. Wouldn’t it be wonderful if we all, just like the Moomintroll and his friends had our own little magical cloud that could take us anywhere in the world we wanted to go whenever we felt the need? To leave behind the almost too-familiar and drab view out of our window on a late and rainy November evening and exchange it for some gloriously exciting, beautiful, awe-inspiring and, dare it be said, sometimes frightening views! In a way, we actually do as there are hundreds and thousands of online webcams for us to peruse. My very own magical cloud materialised in late March 2010 when a fissure opened up on the saddle between Eyjafjallajökull and Myrdalsjökull at a place called Fimmvörðuháls (“Five Cairns Pass”) and the generous Icelanders quickly positioned cameras to show this latest wonder to the world. Together with many others, I spent hours glued to my chair in front of the PC, ogling the views provided. The very best views were to be seen when then the sun had set and just before total darkness engulfed the fire fountains. Looking back, I think many of us can say of those days – “that’s when I became a volcanoholic”. Unfortunately, my PC-skills were such that I had not yet discovered that via the simple expedient of pressing the “Prnt Scrn” button and then pasting the resulting “screen grab” into MS Paint, I could make my own photographic record of the event. By the time the main eruption of Eyjafjallajökull started on April 14th, I had rectified this deficiency and made hundreds of webcam photos in addition to spending almost all of my free time glued to the screen. Eyjafjallajökull at 21:25 UT on April 14th 2010, the first day of the eruption as seen on the Mila Valahnukar webcam. 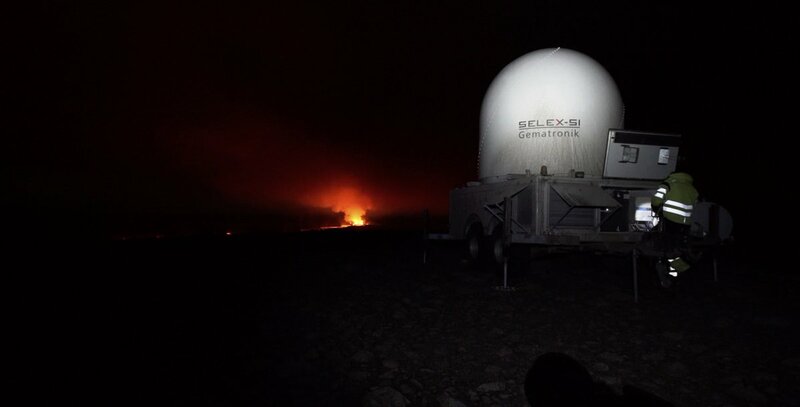 Again, the generous Icelanders hastened to set up webcams to showcase the eruptions with Mila providing live streaming of the event while Vodafone provided high-resolution stills that updated every minute or so. I cannot recall now if it was on the second or third day of the eruption Mila set up their Hvolsvöllur cam which was to provide the most spectacular views of the eruption. As an aside, there are advantages and disadvantages with both types of webcam. Live stream webcams let you follow events in real time, albeit at a lower resolution. You can sit with your finger hovering over the “Prnt Scrn” buttom and have a reasonably good chance to capture the more interesting and transient events. The other type of webcam provides stills that update every 10 seconds to five minutes. While there is a very high likelihood that you will miss the most interesting events, you do have time to make a judgement on which frames to grab and, usually, at much higher detail resolution. The great Tolbachik fissure eruption as seen at 22:23 UT on December 30th 2012 – in fact this was sunrise on the last day of the year in Kamchatka. These are some of the places my little magic cloud (petit nuage magique) has taken me over the years. 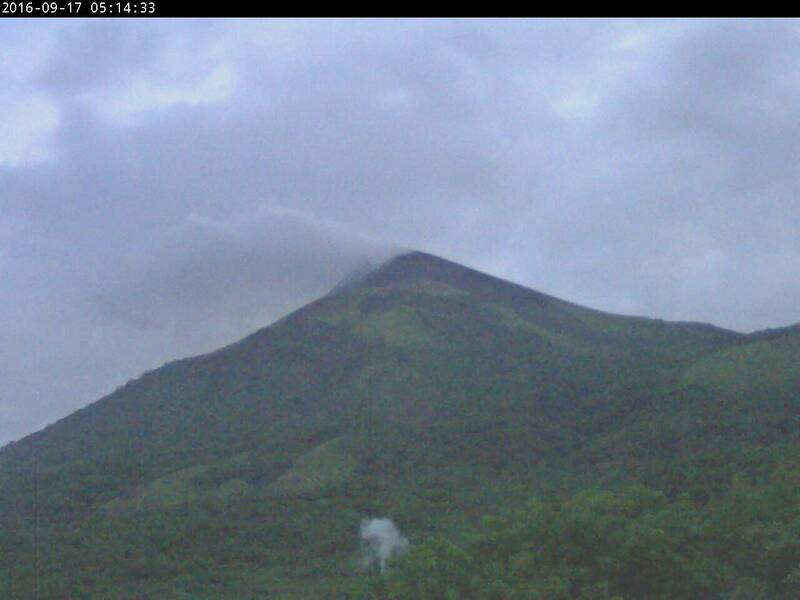 Which is your favourite memory of volcano-watching via webcam? Is there a particularly stunning or interesting webcam capture that you would like to share with us? Yesterday, there was an earthquake swarm directly below the Momotombo volcano as reported by Albert. Today, the webcams show an increase in out-gassing and the seismographs show numerous brittle quakes and tornillos, signs of magma moving upwards in the system. Momotombo began an eruptive cycle earlier this year after a century of quiet but has been relatively calm for the past few months. The recent activity could signal a renewal of eruptive activity and thus it is one to keep an eye on. Here are links to the three webcams that update once every five minutes or so. Do not forget to bookmark them! And there is more activity happening at Momotombo. In the early hours a fumarole was born on the flank of Momotombo, and two hours later this happened. 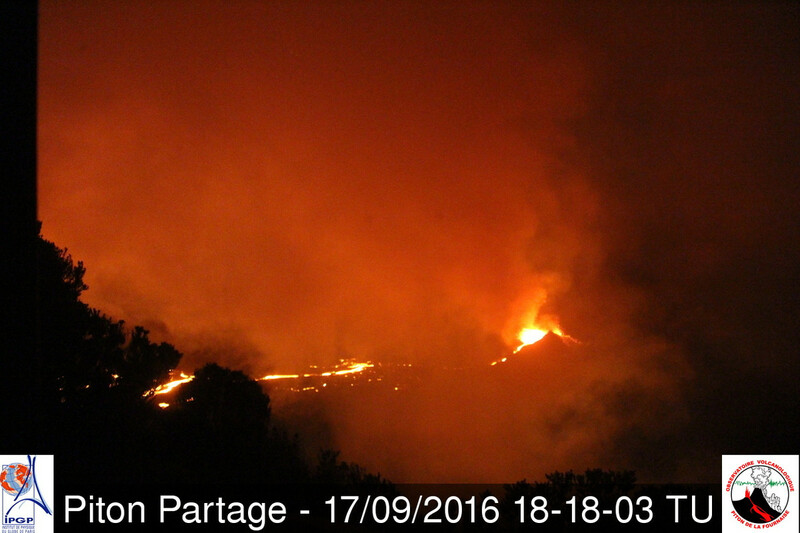 Intensification of the fumarole two hours later. The fumaroles goes nuts at 2 hours and 5 minutes after being born. Back in 04, I used to watch the St Helens Webcam religiously. I would feverishly watch for any little “puff”. Favourite one I’ve watched on the webcams was a summit paroxysm at Etna a few years ago. A bunch of us were on here commenting about it and it turned epic – people were calling it “Etnatubo” and a few people (including Carl and Henrik if I remember correctly) got carried away and added “Tubo” to their user names. It was brilliant. Actually, the eruption of Etna in 1992 is the first one I remember really following – I came home from school every day and went straight on teletext to look for updates. My mum says I was also glued to the telly when Pinatubo erupted, but I don’t remember that one first hand – Pinatubo was a couple of weeks before I turned 7, so I must just have been too young to retain the experience in my memory. Yes, that was an epic! Did we really get that carried away? Yes we did. It was hilarious. – It was a live stream *with sound*; I would go to sleep with it growling away in the background. I’m really disappointed at the number of volcano webcams that don’t offer sound. Not a webcam thingy, but I remember during the 2011 Grímsvötn eruption, that I looked more than a few times to the northwest hoping that the clouds would clear up enough for me to see the eruption plume in the horizon. Alas didn’t clear up enough, but I would have scrambled to the top of the highest mountain here as fast as possible then. The beauty of webcams is that you will not miss the eruptions. I have spent a long time near or on top of volcanoes while gloriously missing to actually watch an eruption. I have missed Etna, Grimsvötn, Soufrière Hills, Anak Krakatua, Majon, Sakurajimi, well the list is long. Suffice it to say that I even spent a night below Stromboli without getting to see anything. So, while being stranded at an airport during Eyjafjallajökull I turned into a fullblown webcam addict watching how events unfolded. After that my personal jinx disappeared and I have had the fortune of watching several eruptions firsthand. My best webcam eruption was though the webcam event that never happened. Before the great Kelud eruption I spent two years happily watching the slow motion extrusion of the lava dome there. And as I saw the signs that it would erupt in a second more violant episode I put up a post here on VC about it, went and bought some snacks and turned on the webcams of the place. Life was good as the evening fell over Kelud and the signs kept on increasing. 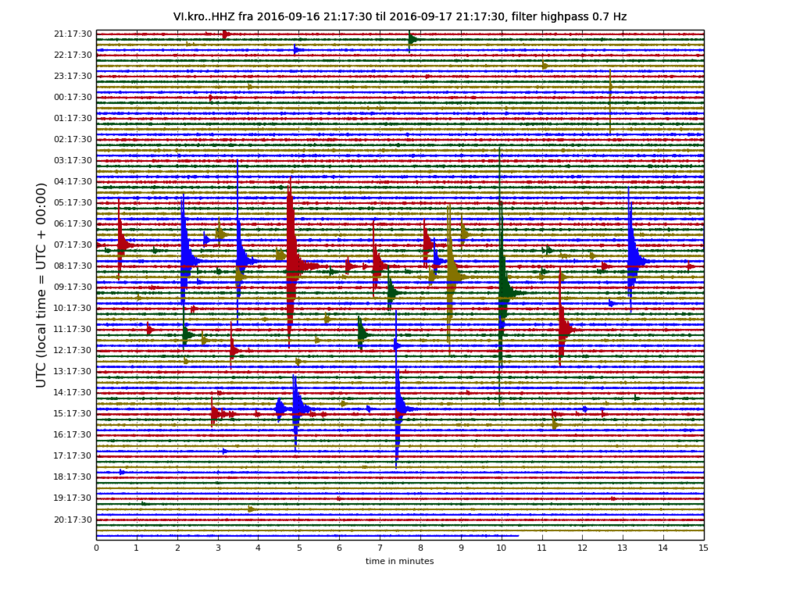 All of a sudden all Webcams shut off and I could see how seismometer after seismometer turned off. This happened about half an hour prior to the eruption, and I suspect that it was intense electromagnetic interaction in the form of piezo-electric activity that short-circuited them. But, creativity is the mother if invention so I used more faraway equipment to follow the short but very brutal borderline VEI-5 eruption that followed. And by querying those of our commenters that live in the vicinity I could even make an isopac-map and thus calculate the size of the event early in the Indonesian morning. To my amazement that calculation of ejecta still holds, the local scientists in the end came up with the same number of 0.8km3 DRE making it one of the two most powerful eruptions in this Millenium. The second one of my 3 favourite eruptions also was to abrupt for even the crafty Icelanders to put up good webcams at since it happened in the middle of Vatnajökull. I am of course talking about the majestic Grimsvötn 2011 eruption. It may not be a surprise that this is the other of the two largest explosive eruptions in this millenium with an ejecta of 0.8km3 DRE. Now to the third of my favourite eruptions. And this was webcam heaven. I am of course talking about R2D2s favourite eruption, Holuhraun. Watching Manhattan squirt out of Baugur was a sight to behold. Even though I prefer to fly out to eruptions I am not going to be able to go to everyone I wish to go to. I do have to work, and many times there is just no airplane going that way since airline traffic is stopped. So, I know there will be many more nights that I will be sitting transfixed watching eruptions as they unfold staring at my screens at home. Oh, I forgot to write about my favourite webcam moment. 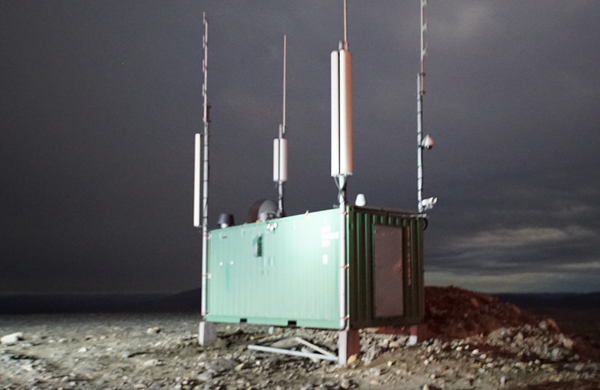 That happened during the Eyjafjallajökull eruption on a very stormy night. All of a sudden a sheep flew past the webcam and tumbled over the side of the mountain the webcam was placed on. That is where our fixation with sheep and volcanoes stem from since many a good old reader in here saw the same thing. It is the webcam moment of webcam moments for most of us. The poor sheep died and fell into a crevasse. That in and of itself is not that uncommon an ending for a sheep in Iceland. After that a certain TV personality, let us name him something unbelievable like Bear Grylls to not point any fingers, found the very dead and half-rotten poor sheep. The TV personality ate the rotten sheep raw, vomited profusely and then turned our favourite webcam sheep into a rather stinky sleeping bag. Poor little sheep was not even safe in death. We will soon interupt our regular posting with an update. Time to brew coffee, pop the popcorn, turn on the large screens. We now leave over to the studio where Henrik is getting the late night news ready. Of webcam staring I have as yet very limited experience, although I suppose Holuhraun was a pretty fascinating eruption. The youtube “fly-by’s” were pretty spectacular. But I think my armchair fascination began some while ago. I don’t even remember which volcano it was, except that it was probably back in the 1990s, and it was Icelandic. I saw he TV coverage of an eruption from a volcano entirely covered by ice. The very notion of a sub-glacial eruption had never even occurred to me before that time, but as the news footage continued over (I’m not sure of the timescale) a few days (?) I saw a large vent blast through ice, and massive glacial floods extending over a huge area. I still have no idea which volcano this might have been. Any idea? Gjálp fissure eruption of Grimsvötn in 1996. It was a highly unique event and surprised quite a few scientists. Be sure and check out the back story of Gjálp and her run-in with Thor. From the tale, it becomes obvious of why they picked tgat name. The volcanic feature produced a ginormous outbusrt flood…. as did it’s namesake. This fascinates me so I will…In the morning. Really tired after a gig tonight (musician). Thanks. Yes, this is definitely the one. The video seems to give plenty of information. I remember the news footage showing the development of this series of cauldrons over several days, and the enormous flood that followed. Few people know how big that one was. The amount of emplaced lava almost rivals that of Holuhraun, and it was emplaced at a much faster pace. The Grimsvötn 2011 eruption emplaced about as much lava + 0.8km3 of ash (DRE). Grimsvötn is one whacked out volcano. 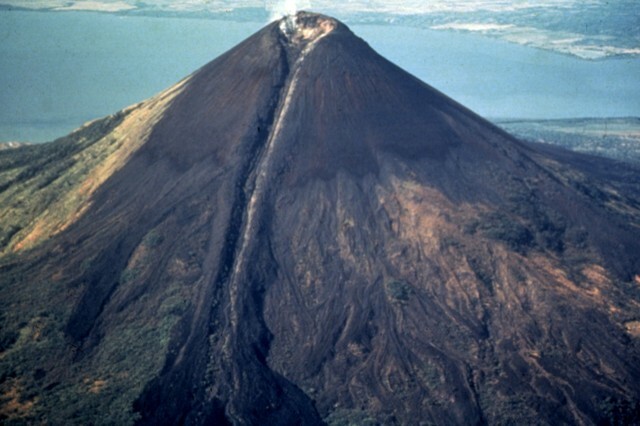 No other volcano on the planet can produce series of eruptions on that scale. The amount of water released was almost beyond comprehension ! For a brief time it was the largest river on the planet. I have coffee, candy and assorted other webcam suitable things and put the Momotombo cams up on the big screen in the living room. Ready to rock thanks to Henrik! It seems to be smoking and glowing but nothing Gjalp-like yet? I blame you. You’ve given the poor thing stage fright. I also blame Henrik for finding the worlds only volcano with a cleavage. Tis not a cleavage, tis the volcano mooning you!!! Seems Momotombo doesn’t have large eruptions very often. A beautiful and evocative post. Thanks Henrik! The Colima (de Fuego) of Mexico I take it? I did include a screen shot of it in the article but have plenty more as it’s a high-quality cam, it erupts very often with little Strombolian hiccups and, as you say, the weather is usually good enough to allow you to see it. The connection to jetpack.wordpress.com was interrupted while the page was loading. Oops, something has gone screwy with Jetpack (our super behind the scenes plugin that does so much work for us), unfortunately (or fortunately) my email link worked ok, so there is no way to check what’s gone wrong. I want to hear more about the flying sheep. I would have loved to have seen that webcam! My last webcam adventure was sitting waiting on an eruption, only to watch a pig that couldn’t make up its mind about whether to leave it’s shelter and come out or not. He must have poked his head out of that door every five minutes or so for about an hour. Yes, flying sheep. Carl re-surfaced the tale a few comments up. Thanks! I have seen some amazing volcano moments on camera, but a few of the most memorable scenes only involved the volcano as a supporting actor….such as the time a bird flew through while Popocatepetl was erupting..or the funny group of tourists that decided to whip-and-nae-nae for the camera at Telica…or the day a single rainbow manifested itself in four Etna-cams…or that morning the Sun rose straight up out of Gran Cono at Vesuvius. Best volcano-moment, however, goes to Bardarbunga..the day “the Beast of Bardarbunga” appeared over the fissure. Yeah, Google was on a tear in the late 90’s buying up all the dark fiber they could find. For them that don’t know, dark fiber are the extra lines in fiber optic bundles that were laid concurrent to normal “pipes” (backbone network lines). Originally intended for redundancy in the event the main trunk went down, they went unused for years… until someone with the money and resources could aquire and make use of them. It was the second one yesterday,the first being 5+km down. Since I have been watching here, the quakes here have been few and far between. Is this one volcano that will surprise everyone ? Certainly from what I have read it will disrupt traffic on the ring road that passes below it’s massive flanks and provide spectacular viewing but since there isn’t a very handy cam I guess we will miss the explosive beginning! I think that, if there are clear signs of a show about to start there, someone would rush out with a camera before the kablooie starts. Or at least one can hope. Spending days and nights on trains instead of aeroplanes, swearing at my icelandic friends because they were not properly taking care fo their volcanous, I was not at all enjoying the Eyafjallajökull eruption. However, a couple of years later I was climbing around on Myrdalsjökull when we clearly felt a tremble in the ice. A few days later there was a jökulhlaup and I started to follow the seismic reports on from IMO. After that I was hooked up and rewarded by the fantastic Holohraun eruption. On the way I found the Café. Hopeless addict since then… Thus, Holohraun are the only webcam shots I have saved so far. Looking eagerly for more! This swarm at Hengill is purely tectonic in nature and probably related to fracking. 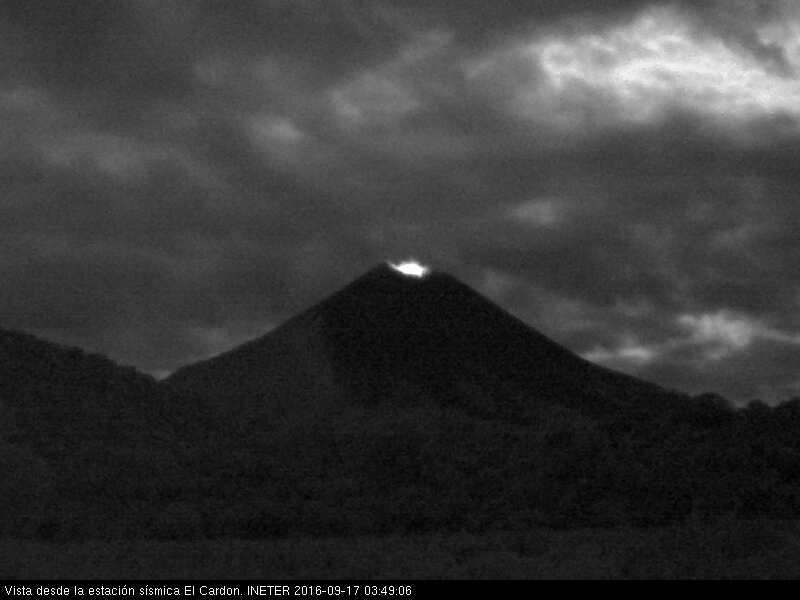 After a night of phreatomagmatic events there is a nice warm glow on top of Momotombo. If things go as they usually do at this stage there will be a more normal eruption relatively soon. If not, you can always blame me for jinxing it. And as morning comes at Momotombo there is active degassing and a nicely blooming fumarole on the flank. The seismic activity has diminished from the levels during the night. 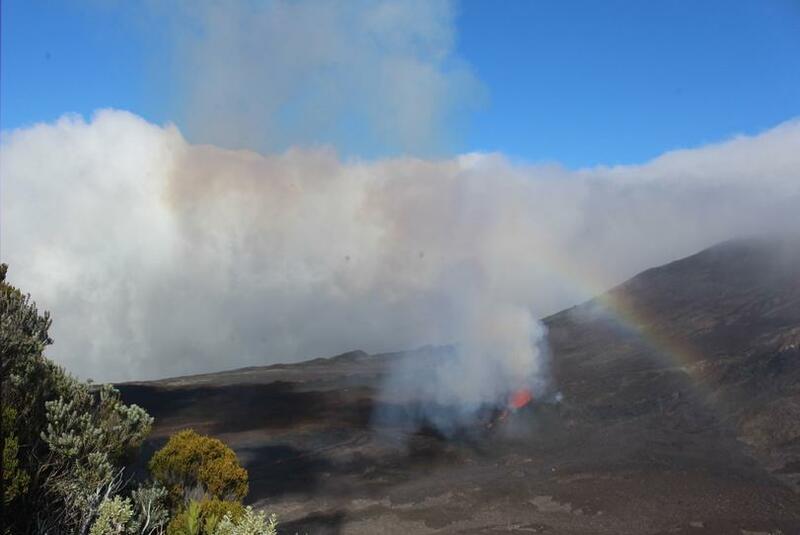 While we wait to see IF there will be a resumption of eruptive activity at Momotombo, Reunion’s Piton de la Fournaise is giving us some stunning views, this one with a local rainbow. I would be a tad surprised if this one fizzled out Henrik. Gas makes no rainbow. This is a rainbow. The slightly indistinct colours and blue being more prominent than red (the blue bands probably repeat but this is hard to see) shows the water droplets are small, but not as small in fog (fog bows become colourless). Droplet size is probably around 0.5 mm. Sizes much larger than 1mm give very clear colour bands, and smaller than 0.1mm gives a grey-white fog bow. Let’s call this drizzle. It is probably a steambow since there was no rain at all there. There can indeed be a thing like a gasbow, but it will not give a full colour spectrum like we are used to with a regular rainbow. You don’t need rain for a rainbow. Anything that causes droplets in the air will do. But it has to be liquid drops: just gas won’t work. Here, it seems the water condenses in the plume. Do not forget ice particles, they also produce icebows. I see them when it is cold enough in northern sweden during winter. Yes, they are marvelous. 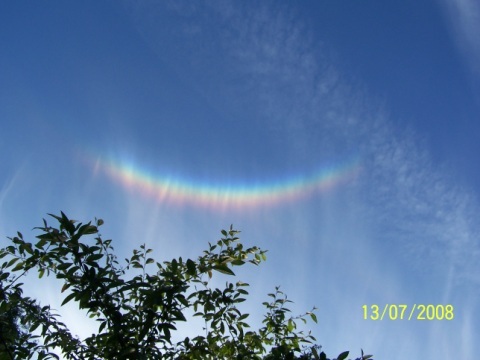 My favourite is the smile in the sky, the circumzenithal arc. It is visible in Manchester fairly regularly but rarely noticed because you need to look straight up! And the phone is down.. In February you often get them in my hometown as more humid air is pushed up above the cold dry air. As the sun hits that it is like the entire sky catches psychedelic fire. And according to your own nomenclature the phreatomagmatic activity that caused the nice glow would count as eruptive behaviour. An intense swarm near Hengill volcano.. The waste is at fault. I blame Henrik. Now since we have decided that Henrik is at fault, who is then going to pay for the beers next time we meet? It was my turn, I think..
That’s quite a bit off energy released due too human actions. If that are wastewater reinjections, why does it goes down to 4,4 Km??? How deep did the have drilled there??? It is about that depth. They have drilled quite close to the magma chamber to get enough heat to run the powerplant on dry steam. Like I said above, it is tectonic in nature and probably related to the fracking project. And people say fracking doesn’t have any effect on the surrounding area? LOL Looks like the kettle is boiling hard this morning at Hengil. And the article has now been updated with webcam images of Momotombos new fumarole going nuts. I don’t know if that’s a fumarole going nuts or a gentle start to a flank eruption! Most likely a phreatic detonation heralding a possible starting point for a flank eruption. There seems to be a little puff there again this morning again on Momotombo3, it may just be visible when its cool enough to condense the water vapour. I know Hengil is related to water injection/Fracking….. but this is a pretty big swarm….. never really understood why it was a good idea to shove anything into a volcano under pressure! These quakes are pretty deep and if there was no fracking I would say it was tectonic but grab your hard hats in case magma found a way up! Ah yes! of course! is that waste water the same sort of stuff as that in Blue lagoon? Basically it is the same. You repump it back to keep the pore pressure at the same level otherwsise the area would subside and the water be finnished. Thanks for explaining that carl. Appreciated. Hengill never erupted in recent centuries, so it seems a relatively safe volcano, but what I find intriguing is that Krafla began its series of eruptions just right after the first geothermal power station was finished in the 1970s in Krafla. I heard reports that a test borehole even erupted magma (the first manmade artificial eruption). I always wondered if the human activity made the eruption easier. Because to my mind, a borehole is insignificantly small compared to a large volcanic system if I am not wrong. Krafla was well and truly ready to erupt on its own and the infinitesimal effect humans could have had would have been towards the opposite. My first volcanic experience started with my trip to Iceland back in July 2009, when I visited Eyjafjallajokull and Katla, and a nearby farmer told me “i have a feeling that this mountain is going to erupt in soon”. I was quite impressed by that prediction and also by seeing Eyjafjallajokull very smooth ice cap, and compared to my second visit to it, during the eruption and then after with a big hole punched in that ice cap! I landed in Iceland in 2010 (as I moved to my 5 year stay in Iceland), seeing the eruption from the easyjet airplane, some 40km away northwards, as the aircraft flew past subtle layers of atmospheric ash and I wonder “the airplane shouldn´t be flying here so near the eruption”. It was amazing however. Sadly when I went to the area was already gone, and then I had my famous moments of melting my boots in Fimmvorduhals and feeling the wobly cooled lava flowe under my feet, with the distinct impression that the lava was flowing just some meters under me. Second volcanic moment, also without a webcam, was Grimsvotn. I was in Reykjavik that day. The night before I dreamt that Laki had erupted and a friend dreamt of a volcanic eruption in Iceland. How proper and astonishing thing to think about. Anyways, that week a US priest or whatever he was, had forecast the end of the world for the day that Grimsvotn erupted, and as it started I was once again amazed by such a funny coincidence. I say, God, if He exists, must be joking with me now. The day was sunny and clear in Reyjkavik and after the news we saw a mushroom cloud eastwards. I joked it was probably Grimsvotn but stating to my friend that such a far away eruption could never produce a tall enough eruption cloud to be visible from Reykjavik. Or everyone is wrong and its actually Hekla or Katla erupting. But quickly we realized it was Grimsvotn, hearing the radio and we saw the thunder as we drove eastwards. Next dawn we drove to Skaftafell, just 50km away from Grimsvotn in the middle of the dark morning. By midnight still total darkness, ash falling like snowfall, and the police asked us to go back. We did! Next volcanic moment, and again a coincidence was Katla event in 2011. My mother visited me in Iceland and while coming from the east fjords we decided to camp by Katla (in Takgil camp which was just at the edge of the ice cap). But because Katla was runmblig a lot that summer I decided that it was probably not safe and drive to Reykjavik instead. That night Katla began its tremor and flood, and the people in the camp we were suppose to go were indeed evacuated by helicopter. Lastly, Holuhraun. I was hiking in Langjokull when the 100s earthquakes started in 15th August. I spent the next 2 weeks trying to catch the eruption and experiencing every few hours the M5 shakings across a significant part of Iceland. The police had already blocked any chances of visiting the eruption. The day it started we were talking of jeep lights in here, but indeed the eruption started by 7pm and someone was right, that fixed light wasn´t a jeep, it was a lava vent starting. By midnight, the light grew and became red and like a fire. I was sure it was an eruption but the official news only came by 1am! The next few days I went there with jeep, just 40km away, scared of how many ways I could die: flood risk, volcanic gas, sudden ash eruption, sinking sand, etc I took the easy and only legal way to see the eruption, which was by airplane, and I will never forget it. The rest of the days I would just see the eruption in the webcams, except for a few days where the eruption could be visible from far away from certain parts of Iceland. Wonderful descriptions Irpsit! Thank you for sharing – it is amazing that you were able to get so close to so many of those sensational eruptions! You’ve always been one to share your experiences with us, Irpsit, thank you! One that was not so much fun to read about but very interesting nevertheless, was how you had to secure your house against all that SO2 at the height of the Holohraun eruption. Hike to Hekla was very pleasant (in 2011 or 2012 can´t remember the year now), but I missed a second change to do it again back in April 2013 when Hekla was very restless and an allert was oficially issued. A group of friends of mine went nevertheless (I didn´t!) but they got the scare of a sudden tremor and rumble on their way to the summit. The quake was never recorded in the IM map so they and I will never know exactly what was. Could have been some movement of ice also. But I can only imagine their faces when that happened. Great description – thanks, irpsit. Makes me want to live in Iceland even more, though the shower SO2 scrubber would be completely beyond me! Yeah I felt earthquakes from Myrdalsjokull a couple of times. One morning when hiking Fimmvorduháls in June 2010, and another time in Thorsmork from Katla I think back in 2011. It seems those M3s can be felt quite well when you are very near the edge of Myrdalsjokull ice cap, but not from Vik. 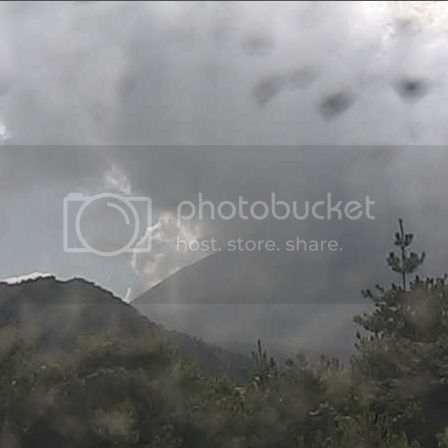 My first webcam volcano was Redoubt 2009. My favorite, however, was El Hierro’s “Bob”. That’s when I found VC and my education began. I was one of several “newbies” that must have driven Carl crazy. But the silly chatter among new friends was so much fun. Of course Holohraun was the most impressive. Thank you, Henrik, for taking us down memory lane. How about that. Saved from an outburst flood from what river? I do not know, could be one of those that has had hlaups earlier this year around Katla. The age of the sword puts it a bit early for being a Varanger-sword. But, on the other hand it has survived to this time in Iceland. A Varanger sword is made by saracen-method by layering the metal, much like a Katana in Japan. Sadly this is in Swedish, giggle it on your own risk. ♪♫ I see a star ♫♪, eh no, it’s two stars 🙂 Two green stars on Bárðarbunga. There are probably going to be green stars regularily for years to come on Bárðarbunga, as the things settle down after the caldera collapse after Holuhraun. Nothing to worry about, at least that how I understand it. The seismic activity at Hengill has picked up with two M3 earthquakes. The largest so far is M3.6. We will see where this leads to, so far the activity is tectonic in nature. And there is a third star incoming now, probably up towards M4. I did a 3d plot of the current activity and all the quakes line up perfectly along a single plane dipping to the west. Looks a lot like movement along a single planar fault. Purely tectonic, possibly lubricated by the fracking? What intrigues me is what IMO have *not* said about this activity. If the eqs – which are above what we are accustomed to at Hellisheidarvirkjun – are being felt in inhabited areas from Hella to Mossfellsbaer and they *are* owing to activity at the power plant, then surely one would expect the IMO to suggest that as the likely cause…? Probably checking to see what they were doing at Hellisheidarvirkjun to see if the swarm was caused by a bit too much water being pumped down. As far as I can understand from Icelandic news, they are a bit taken by surprise by this activity since they did NOT change anything at Hellisheidarvirkjun. Isn’t the most likely explanation that this was a completely normal event for the SISZ? It just happened to occur next to the geothermal power plant. This is definitely a tectonic event. It is days since the last reinjection there. Apparently the magma intrusion before Fimmvorduhals was right under Eyjafjallajokull ice cap all the way up to 1km deep, then magma turned eastwards to Fimmvirduhals 3 days before the start of that eruption. That 1km turn eastwards, is already within the mountain itself. This contradicts what has often been stated here in the blog, that Fimmvorduhals itself was fed from a feeder dike right under itself and that a portion of that magma triggered the old evolved magma located under Eyjafjalljokull. No, it seems that the feeder dike was right under Eyjafjallajokull ice cap, and actually 5km east of Eyja main vent, and 5km west of Fimmvorduhals vent. So actually located halfway in between. Nothing shows of a connection to Katla, as well said often here in the blog. At 10km deep the magma seems to have intruded all the area under Eyjafjalljokull, from the main vent towards Fimmvorduhals. No offence to our “experts” as you can only hazard a guess as to what happens under the ice. What is up and what is down in a volcano? Or, how would you live your life as a volcano? Some interesting comparisons of ash, lava and DRE volumes of Icelandic eruptions.